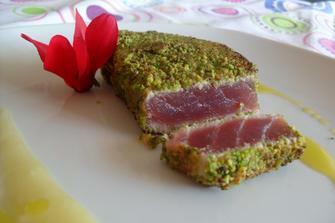 To make tonno in crosta di pistacchi, tuna in a pistachio crust, place one piece of fresh tuna in the freezer for at least an hour, which will make it easier to cut, without breaking its fibers. Cut it lengthwise into 2-3cm-thick slices, put them in a baking dish, and pour the olive oil over them. In the meantime, pat dry the dried tomatoes to remove excess oil, then chop fine with a knife. Put into a bowl the chopped pistachios, tomatoes, poppy seeds, and bread crumbs. Mix everything together, salt the batter as you wish, then put the tuna slices in the batter, pressing them down on all sides. Put a couple of tablespoons of olive oil in a no-stick pan; when sufficiently hot (the oil should sizzle), put in the battered tuna and cook 1 minute per side, turning it just once. Don’t cook too long: the tuna should stay pink inside; if it becomes white, it will be tougher. Take out and cut into 2cm-thick slices, then serve immediately.